Earn $4.99 in Rewards credit (499 points) What's This? Train without the trade off. Clément has improved their standard Strada LGG with a supple 120 TPI casing, resulting in an amazing ride quality without sacrificing durability or adding weight. Like the original, the Strada 120's tread takes cue from Clément's classic clinchers with chevron shoulder textures and a slicker center stripe. This results in a tire which rolls quickly on straights and corners predictably on wet or dry pavement. But unlike its 60 TPI counterpart, this Strada uses two rubber densities to further its impressive balance of speed and traction. The harder center rubber compound also resists wear, making the Strada 120 a great choice for off-season training. Tough belting has also been placed directly beneath the tread for effective puncture resistance. I have been using the 32mm version on my cx clinchers for commuting/training/urban adventuring. My wheels are wide, and these tires measure out at 35mm installed! They were easy to mount, and I haven't had a flat yet. They do roll well wet or dry, although wet cornering traction is noticeably less than a tire with a more race-oriented compound like a Conti GP4000 S2. Otherwise, they're great. 9 of 13 customers found this review helpful. These tires have an extremely nice ride but don't last very long. I installed a brand new set in March (2015) and already replaced the rear with the front needing replacing soon as well. I loved the ride the clements provide, they corner well, grip well in the wet and were decently puncture resistant (until they wore out). I'm quite disappointed in how fast they wore out 2500 miles doesn't seem like much for a durable training tire. 28mm are nice for road and mild gravel if your bike will fit them. 14 of 16 customers found this review helpful. I run the 28mm ones on my Lemond Buenos Aires and olde 1990-sh Scapin roadie. So nice and plush. Really smooth out the rough roads and work pretty well for some gravel jaunts as long as you don't wanna do 10' radius turns or hammer up 15% dirt grades - they'll let loose on you in those scenarios. I've got about 1000 miles on there and I expect about another thousand from the rear. As if you morped Vittorias and Contis! 18 of 19 customers found this review helpful. Abstractly, I prefer Vittoria, particularly the Open Pave. I like the gummy tread, a fairly soft rubber, because it makes for a smooth ride and good grip in weather. But because the rubber is soft, it cuts relatively easily and it is beaten up by salts and chemicals in the winter. On the other end of the spectrum, riders rave about the durability of Contis particularly the Gatorskins. Problem is, I hate the hard Conti ride and found them slippery in weather. The Clement is a hyrbid of the two. A smoother ride than the Contis, more durable than the Vittorias, grippier than the Contis. In the winter, with the premium on durability (who wants to change a flat in the cold), pretty great tire. That said, this tire is not as good as a XPLOR MSO. That tire is simply great. Black Mountain Cycles owner Mike Varley suggested this tire for his V2 steel road bike. I started with 28 mm and recently switched to 32 mm. It is hard to describe how comfortable and solid this biketire combination feels. Bike path or pavement, rough or smooth, damp or dry, just very, very good. I have the 32mm, 80 and weigh 185. Have these on a Soma San Marcos. Bought as a sportier tire then the Conti Gators I usually run. These roll well, are fast, corner well in addition to looking better than the Gators. No flats so far, but no doubt will puncture easier than the Gators. 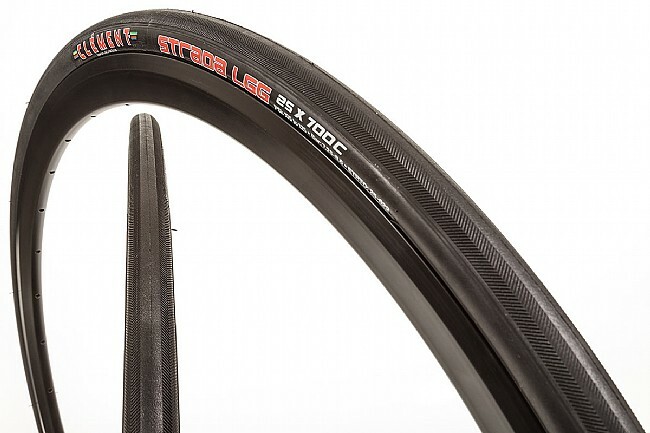 I also run Michelin PRO 4 Endurances on other bikes and these seem to as good or slightly better, but the rubber does feel thinner ergo may puncture easier. The thickness feels much closer to the Conti 4000s I run on my racing bikes. So far quite pleased. Note I DO NOT ride in wet weather so no idea of how they perform on wet roads. I read a nice review on a blog I follow, so I tried them. They are now on 4 of my bikes! I have 28's on a tandem and 25's on my go-to rides. They are supple on the turns and straights, not as harsh as the tires I USED to use. Very long-lasting and attractive to boot! I get many comments from other riders and I highly recommend them. I will continue to buy them until I find better tires, which I doubt will happen! When I see that they are on sale I usually buy several. 5 of 7 customers found this review helpful. I bought these tires for the fall tire swap over as the weather deteriorates in New England. The reviews were solid and I thought these tires would be a nice compromise between a race tire and something like Gatorskins. I have a few hundred miles on them at this point. While they are both durable and supple, I find them really sluggish and slow - far more so than I expected from a tire that is reasonably light. I couldn't quite figure it out until I tried to ride them on my rollers. They are so grippy and sticky that I couldn't really spin them on the rollers and I had to swap them out. This may work for some people, but I want all my tires to be fast - even training tires. I'll break out the Stradas for really poor weather riding, but they don't fit the bill in what I'm looking for in a good training tire. Once they wear out, I won't replace them. As an aside, a buddy of mine bought the same tires and I asked him what he thought. He responded with one word - heavy. While I'm a huge fan of Clement CX tires, the Strada LGG 120 TPI falls short. Awesome tires! High performance and plush. Only have about 500 miles on them so I can't speak to their durability yet but plenty of bad roads and gravel with no flats. I have been loving the ride and grip of these tires. They've been my training tires for this fall and winter. Comfortable and confidence inspiring in sloppy conditions. However, the soft rubber and casing that makes these so pleasant is also getting very cut up. I've flatted four times in five hundred miles with flint stuck in new cuts. While I love the feel and price, I'm giving these up and looking for something that will hold up a bit better on wet, gritty roads. For a larger volume tire, the Strada LGG offers great road feel and decent grip. However, I have found them to be quite fragile, especially at lower pressures. After only 350 miles, the rear tire had numerous cuts in the tread and a small piece of road debris not only caused a puncture, but also caused a large tear in the casing. Pressure was 90 psi. I don't expect these to be as tough as a Panaracer Ruffy Tuffy, but they were a let down. These tires handle very well and are easy to mount. 1 of 8 customers found this review helpful. These are the stock tires on my Novara Trenta which has a red, black, and white color scheme, so they look great and handle very well. I have a couple hundred commuter miles on these with no issues. Ride is good. So far no punctures. 14 of 14 customers found this review helpful. I switched to Stradas last fall as my bread-and-butter training tire after positive experiences with Clement cyclocross tires. The Strada 25s roll smoothly and offer plenty of grip while cornering on wet, sanded roads. They're also resistant against debris, I plucked a lot of garbage from the treads this winter with no signs of penetration in the belting, and haven't experienced any flats. These aren't the lightest tires on the market. However, the Strada's comfort and reliability offset any weight penalty in my opinion. I just bought another set of 25's for racing, and plan to stick with them so long as they sell at a modest discount to Contis and Vredsteins (my other bread-and-butters). Working out well on the winter bike, durable and sticky with plenty of beef on the 25s. Purchased specifically for the winter bike ... road bike for messy roads, gravel, etc. They mounted up nicely, but have somewhat higher profile vs. wide profile on my Eurus wheels. No flats so far and they seem to hold the road well. Will be very pleased if I get some miles out of them.